Personality: Senkou, a lot of times can come off as a calm, yet extremely aggressive person. He is often feared by his peers not only because of his reputation but his sometimes out of line behaviour. He has a hard time with authority figures, as he is always getting in trouble from the Kazekage for insubordination. He simply believes that if he thinks there's a better course of action for a particular situation then he should go with it. He doesn't have much of an ego, so he usually doesn't have any problems underestimating an opponent and being defeated. He doesn't like to 'judge a book by it's cover' especially in the ninja world, as doing that would probably lead to one's death. A lot of times he comes off as being completely heartless, as he always tries to get the mission finished no matter what the cost is however when it comes down to it he would rather fail a mission to keep his squad alive then risk something like that. He is definitely a man of his word, as whenever he gives someone a promise he makes it his business to make sure that he comes through. He does this because he would like to think that if someone made a promise to him that they would fufill said promise. If there's one thing he hates, it's betrayal. If a close friend of him was to betray him he would go out of his way to take them done. Matter of fact, he would make sure that he took them down no matter the circumstances. This especially includes Missing Ninja. He believes that a bond between that of a ninja and his homeland is sacred, and anyone that would cut that bond doesn't deserve to be a ninja. With that being said, he is obviously very loyal to his village, as he would die on the spot for it if it was necessary of him. Although he has a deep love for Sunagakure, he isn't too found of the desert. He would actually be more happy in an envoirnment like Konoha, something full of nature. Kekkei Genkai: The KKG of the Akatama is an extremely advanced one. It involves not only high speed cell regenerate but the ability to manipulate their own blood as well. This Kekkei Genkai isn't particularly tricky. If the user is stabbed or something, they will be able to regenerate their blood cells in order to keep themselves from losing blood and ultimately making them semi immune to physical attacks. That being said, there is really only so much blood that the user can generate at one time, so if the opponent does some serious damage to the user like cut off a limb it'll be harder for them to heal themselves while still fighting. When injuries are extremely bad, the user can apply chakra to the area and it will begin to speed up the process. The more chakra used the faster and more smoothly the wound will heal. Now with fighting with the KKG, the user is able to use their own blood to attack as if it's an element. Because of their rapid regeneration it doesn't matter how much blood they extract from their body, they'll just regain it. Also, by applying their own chakra to the blood they're using they will be able to solidify the blood, being able to create many weapons. Also, the user is only able to manipulate the blood from their body, they will not be able to manipulate the opponent's. 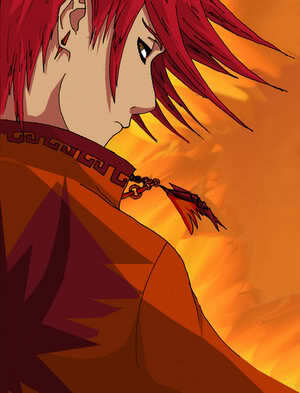 The Akatama are known well for their ability to do this, as Senkou Akatama was given the nickname, "Suna's Red River." from his peers among the village.